The list of maintenance issues for fleet managers is a lengthy one. Oil changes, tire wear and engine performance are just a few of the areas that need to be monitored. That’s why it’s easy to ignore the importance of fuel additives. Additives commonly found in gasoline that can protect a vehicle’s fuel system and engine aren’t found in diesel fuel. That’s why it’s important to consider how to supplement that deficiency to ensure the diesel fuel in your vehicles burns correctly so the engine produces greater power combined with increased fuel efficiency. The benefits of regularly using a fuel stabilizer can pay off huge dividends when it comes to the total cost of ownership of work trucks. Choosing the right additives for your fleet depends on numerous factors like driving conditions and the geographic location of your operations. An additive to protect against the cold during winter and one to keep fuel injectors clean are some good general fuel treatments to protect most fleets. Corrosion inhibitors – You can reduce the effect of water in diesel fuel contacting metal components in the engine with a corrosion inhibitor. Cold flow aid – A significant drop in the ambient temperature will create wax crystals in fuel. Keep them small and reduce the temperature at which fuel gels with a cold flow improver. Detergents – Fuel cleaning detergents will clean and break up harmful deposits that can form on critical engine parts. Lubricants – A lubricity improver will keep critical engine components like fuel pumps lubricated and reduce wear. Wax inhibitors – A wax anti-setting additive will keep wax crystals suspended in fuel for longer periods of time. Your fuel isn’t always going to operate in the Goldilocks temperature range – never too cold or too hot. Frigid winter months require the use of an anti-gelling additive to keep the fuel from congealing and fouling the engine. Maintaining the proper coolant level has become a year-round focal point for fleet managers. Ensuring your fuel’s integrity in either temperature extremes will help an engine to run smoother, more efficiently and cleaner. Like anything, carefully read the guidelines of any additive you’re using and follow the prescribed usage. Overuse can result in a sticky engine residue that defeats the purpose of your fuel treatment plan. Our On-Highway team can help create an additive plan to best suit your needs as part of an overall maintenance schedule. 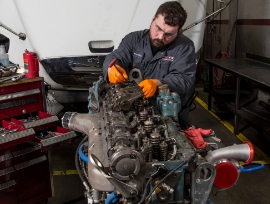 Trust our factory-trained technicians to optimize your engine’s performance.